Two east coast teams, both fighting for a playoff spot, faced off in Chester on Saturday night. Philadelphia Union, coming off a standout victory against NYC FC, have found a solid run of form recently. Their opponent New England Revolution, on the other hand, seem to be trending downward, having gone winless since June and looking at a difficult, road-heavy schedule ahead of them. At the final whistle, both teams would remain on their same respective trends, with Philadelphia Union shutting out the Revolution 1-0. The first half left fans from both sides wanting, as the two clubs entered the locker room without a goal and without much else to boast about. The Union were the better of the two, stringing together some plays early in the final third, the most dangerous of which developed from a C.J. Sapong through ball to Cory Burke, who managed to get a shot off. The shot was wide, but the two would continue to link up again nicely throughout the half. The second half told a much livelier tale. Within seconds of the starting whistle, Alejandro Bedoya gathered the ball outside of the box, zig-zagging his way inside for a shot that was blocked by New England keeper Matt Turner. Soon after, in the 49th minute, the Union put together another great play, as Dockal hit a set piece square to Haris Medunjanin, who placed a great lob into the box. Keegan Rosenberry got to the ball first and shot into the shin of Matt Turner. Still no goals, but the intensity was ramping up. 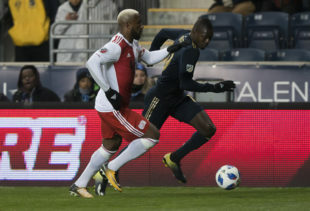 The Union would continue to pepper New England with blocked and wide shots until a bizarre situation in the 53rd minute. Medunjanin played a lofty ball behind New England’s back line to Cory Burke, running wide. Burke gathered it, and took it to the center. One on one with the keeper, Burke fired it to the near post and scored. The flag was up for offside, however, and Burke’s goal was denied — temporarily. Unaware off the offside call, Burke celebrated to the crowd, removing his jersey. The referee, unsure of the offside call, called for a VAR review. Ultimately, the offside call was reversed. Burke had indeed scored. 1-0 Union. Soon after the VAR decision and before play resumed, an altercation ensued between Medunjanin and some of the New England players, after which a fired up Medunjanin egged the cheering Talen Energy Stadium crowd on. A yellow card was issued, not to Medunjanin or any player for the altercation, but to Cory Burke for removing his shirt after his goal three minutes earlier. The onslaught didn’t cease there. All of the Union’s front six plus right back Keegan Rosenberry continued to create scoring opportunities in and around the box throughout the half, putting 10 shots together. None would go in, but it certainly provided for a more entertaining show than the first half. New England also had a slightly better second half, putting five shots together, but none found success. Andre Blake put on his typical outstanding performance to keep the shut out and keep the victory. Staying strong. After a poor first half, the Union did well to come out strong in the second half. No earth-shattering tactical changes were made at halftime, but the team played with much greater urgency and refused to let the sloppy first-half play rattle them mentally. Union squads of old can’t say the same, so this is a very good sign for Union fans. Cory Burke. Burke continued his solid play as the Union’s top goal scorer. Not only did he add another tally to his stat sheet, but he is clearly developing as an overall player. Because he has become such a scoring threat, New England’s center backs collapsed in when he received the ball, which gave him space to make plays and string some passes together. Burke took full advantage of those opportunities, something we haven’t consistently seen from the Jamaican before. The Union are now 6-0-0 in MLS play when Burke starts. Haris Medunjanin, the showman. If there is one thing Philadelphia sports fans want in their teams, it’s a player whose passions match their own Think Brian Dawkins or Allen Iverson. The Union have lacked that type of crowd-pleaser in the past. Medunjanin has stepped up to that role this season, as evidenced by the incident in the 56th minute. The Bosnian midfielder clearly gives it his all, lives or dies with the team, and involves the fans. It’s an exciting thing to watch. Fair & Balanced continues both for the team and this poster. Really nice to see the Union- Just Playing Well- in late summer. There are times when the frenetic pace is a hinderance to my pleasure … as I get NFL viewing type ‘fight anxiety’ instead of ‘flight repose’ which I count on footy to provide. Have to make a continual peace about that. Moment of game for me was Haris on goal line settle/save then dribble out of 6 with a deft fake to off balance closing Rev…. then release while sipping a glass of wine. Class. Stout defensively becoming a reality week after week . Andre secured the 3 points in final 30….I love the Sapong for Ilsinho switch which seems to be a go to move for Jim now and amps up team maintaining their attack mind.
. Love seeing Derrick over Warren I that spot…. Good sign for the player… second best moment of game for me was the chutzpah and passion Jones showed late in game to Rev up an already in tune crowd. All in all…. damn straight. No Kelyn Rowe again ….still baffles me. Agree with almost all of this (including the No Kelyn Rowe bafflement). I’m just a bit less sanguine about their overall play, since they looked really sloppy in the first half. I actually thought something was wrong with the pitch — passes seemed to die early, and the ball would take really strange spins. Oh, and I too couldn’t believe Medunjanin’s sang froid after that goal-line clearance. Dude just settled and calmly made an outlet pass like he hadn’t done anything. If NE doesn’t want Rowe, I’ll take him. Dude is pure class at multiple positions. Shaky to put it mildly. Loved Haris’ resolve to fight through 27’s incessant manmarking. Burke’s goal was a beauty, the epitome of “play to the whistle” and I’m equally happy Haris set it off. Keegan looked way off tonight, obviously not himself. Happy with the points but hoping everybody can wake up. Tells you what the other coach thinks of your player when he disrupts his own defensive scheme to man mark someone all over the field. That just highlights who assisted on the goal. Exactly. Despite recent criticisms he’s still the deep-lying puppetmaster that can threaten teams with a single ball. Case in point. Go Union. Not the best performance against a weaker team but 3 points is 3 points. Hopefully Ale is OK and they are able to play better Wednesday night. I can understand how the linesman got the call wrong since I thought he was offsides as well until I got home and saw the replay. Kudos to Gaddis for setting the team record for minutes played. On a side note, I definitely preferred the New England fans tonight to the NYCFC fans last week. Not the best game compared to the one (last week vs NYC) I couldn’t make and had read about. They couldn’t pass or dribble or do much of anything in the first half. It was rough. But hey… the 3 points is what’s important and they got em. I was in section 127 and was so sure Burke was offside I didn’t even watch him finish it. Shame on me I guess. Me and 4-5 others around us couldn’t believe he was on. We were just convinced he was off. Just watched the replay and he was even with the defender. Amazing job. Playing and beating the same team 3 times is truly rough in any sport. It was a tale of 2 halves. But this time we won! Harris is becoming the heart of this team. Nice win on a nice night!! He is not a crunching tackler by any means but he tackled the ball well several times tonight. The Union’s program on individual development plans worked on in the second sessions of the two-a-day practice days pays dividends. Agree. He really seemed to get after the Revs. in the second half. Also Ray has been much improved. So point well taken. Sometimes it’s pretty, sometimes it’s not. Depends if the opponent wants to play soccer or wants to kick you all night. One correction. Union had a home playoff game in 2011 vs Houston. Also, it’s not a large part of the river end that is booing Curtin. It’s a small, yet very vocal minority. It’s also the same minority that’s been trying to bring back YSA on goal kicks. I’m 50+ yards downfield from the SOB’s but it seemed like there were less boos for Curtin last night than there had been in recent games and maybe even a few cheers. First, being a local guy matters not one bit. Cherry on top, sure. The attractive soccer is nice after so many years, some of which were under this current coach. Curtin will also forever be hindered by the fact his learning curve seemed to take forever. When most of the fans know how/when/where to make moves the coach is hesitant to and frequently inevitably makes somewhere down the line, he’s going to get ridiculed. Now this year has been different, and he’s shown an ability to change, all kudos to him. He still started C.J. too much and probably cost this team points, and that’s never good as a coach. He’s still in a show me state for me. It was a great environment Saturday night (especially the second half). I was surprised by the poor turnout by the SOB’s – Lots of empty seata. So here’s a question. Wasn’t this one of those games that bad teams lose and good teams win? Things just didn’t seem to go right. Passes were misplayed. Dribbles would seem to just run away (Keegan). But the effort was still there. They end up scoring in the second half and hold on, closing out a win. How much of that match was near impossible to see from the Union two years ago? Even a year ago, that match could not have played out that way by the Union. Agree 100%. Team looked completely out of sync in the first half and you could feel one of ‘those’ performances that have stopped momentum in previous seasons. Whether it was the coach or the players at halftime, Union came out immediately in the second half and attacked, as Bedoya won a corner. It was very noticeable in the second half all of the 50/50 balls they were winning, and challenging to get possession back after a turnover. Kudos to Curtin for giving Jones the run in the closer spot that has gone to Creavalle. And kudos to Jones for stepping up and doing well with his opportunity. The fact that we had a shut out surprised me most. In the past this would not have happened. But 2 incredible saves by Blake and the goal line clearance by Haris (while he was at the near post on a corner!) made it happen! Wow!!! Ilsinho should have had a penalty or free kick on the line since he clearly was pushed in the back when he dribbled into the box. There were a couple of non calls deep in New England territory late that the stadium wasn’t happy with (I wasn’t close enough to tell if they were the correct calls) but the bigger problem I had was why the Union players were driving towards the center rather than the corner at that point. Play to win not to lose. I hate going to the corner to waste what, like 15 seconds when you have a chance to get another goal. NE was hacking us all night which I think is part of the reason we didn’t look as crisp. For most of the game, going for another goal makes sense, but once you are getting into stoppage time you want to make it as difficult as possible for the other team to score. Unless you have a clear breakaway, going to goal will either score or give the ball away in a second or two. Going to the corner can waste 30-60 (especially if you can earn a corner kick) and forces the other team to go significantly further when they get the ball than going to goal, having the keeper get the ball and kick it downfield. Eh, most of the time it doesn’t waste nearly that much time, like 15 second more that trying to score, or you can cycle the ball back around and use a ton more time. Plus I think you have just as much of a chance or getting a corner if you go to goal and the actual chance of scoring. I think it’s just a losing mindset and I never want my team to take their foot off the gas. I thought that Burke might have been offside as well on the attack leading to his goal, but the three most important people did what they were supposed to do: Burke, hearing no whistle, played on; the ref used his discretion and allowed the flow of play to finish; and the goalkeeper wasn’t taking chances, so he played on. Well done to all of them on the play, and the keeper has no reason to hang his head for being beaten. Burke played it well. As to the Revs’ behavior throughout, whining, stalling and an insatiable desire to have a conference with the ref after every call matched their willingness to play a chippy, nasty game. It doesn’t surprise me that they would up giving up on a close play. I was surprised to see that the Union continued to attack the goal as the game wound down, but attribute that to a lack of familiarity with holding a close lead. Maybe a coaching point has presented itself for Jim Curtin this week. Wind down the clock and take the ball to the corner, so that, if it is lost, your opponent must get it back out of the corner, the full length of the field and through all 11 of your team to even the score. Poor first half, with too many bad passes or dumps to empty space, but a gritty win. Well done, boys. I might be in the minority but it looks like Sapong and Burke are starting to gel a little up top. Sapong played really well on the right side holding the ball as Burke ran into space. CJ looks like he can pass much better than he can convert wide open shots from right in front as he sailed another one over the bar. Also Dockal or Bedoya need to make a run into the box when Fafa makes his run to the line and twice crossed the ball back to open space with nobody there in wide open space. Otherwise this might have been their best win of the season as they played really bad but still took three points from a desperate team. Although NYCFC was their best quality win this one was a six point game and pushes them into striking distance of fourth place. For me it’s the game the Union could never seem to win in the past. Big win for sure. +1 to all of this. CJ IS looking better (not good yet, but better) with the ball from the wing. Unforgivable for Fafa to make all these gut busting runs and to find no one busted with him. To answer a couple of posts higher up the page, I think this was a case of a team winning a game it was supposed to win, with it’s “C” game. Though the gears were out of sync, they out worked the other side and overcame their mistakes. The Union have been on the other side of these games for years, I think it’s a significant confirmation of their improvement that they won one like that. I thought the Revs were using a lot of slide tackles. Some looked pretty ugly. Using both feet,possibly studs up. Any one else notice? Yup definitely. Ref was not good. Absolutely nasty, scissors on several occasions. This was a certain loss of points in every prior Union season. Dare I begin to have confidence in 1-0 leads?